Would you like to learn the skill to convert stress and problems in your life into opportunities and benefits? Would you like to go into every situation with knowledge you can turn it into a victory? Don’t just deal with change…MASTER IT! Change is inevitable…suffering is optional and Carpe Aqualis! is an innovative entrepreneurial approach with strategies to make change work for you rather than against you. Life is not developed by what life gives us; it is created by what we do with what life gives us. Destiny is not found in the raw materials life provides us; it is forged in our creation and built from the opportunities we are given. Carpe Aqualis! 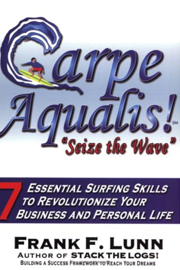 will equip you with seven essential surfing skills guaranteed to revolutionize your business and personal life. More than concepts and theories, Lunn's book hands you the tools and practical insights to apply immediately in your life. You will enjoy this entrepreneurial tool kit for everyday application in converting change and stress into beneficial opportunities. Regardless of what happens around you or to you, Carpe Aqualis! will equip you to Seize Your Wave to create advantage and opportunities in your life! Frank F. Lunn, a former soldier and current business owner, entrepreneur and also author of Stack the Logs! Building a Success Framework to Reach Your Dreams uses his powerful and energetic writing style to tackle the serious side effects of resisting change. Lunn is an experienced small business professional and a respected authority on opportunity and motivation who understands how to make change a constructive force. Frank Lunn writes from his heart in a style that will grip you from the very first page.